LOS ANGELES--(BUSINESS WIRE)--Semtech Corporation (Nasdaq: SMTC), a leading supplier of high performance analog and mixed-signal semiconductors and advanced algorithms, announced that Apana®, a market-leading technology company focusing on smart water utility systems, incorporated Semtech’s LoRa® devices and wireless radio frequency technology (LoRa Technology) into its smart water sensors, saving Costco Wholesale Corporation (Costco) millions in overhead operation costs. Apana's innovative IoT solution has over 800 installations worldwide and has saved over 500 million gallons of water to date. The company serves a wide range of water-intensive businesses including supermarkets, hotels, car washes, food and beverage processors, and commercial buildings. Apana’s LoRa-based solution tracks the water usage data in real time on a private network and provides alert notifications. The alert notifies facility managers via text message on their mobile devices. Ongoing reporting enables companies to evaluate the data and determine trends to target conservation initiatives. This allows more efficient water use, and as a result can save the customer millions of gallons of water. “Apana provides companies a cost-effective and reliable solution for water management as well as the ability to save millions of dollars in overhead cost. 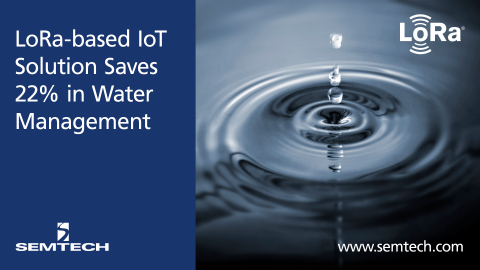 As water becomes a scarce resource, cities and governments will begin implementing IoT solutions to create a smarter planet,” said Alistair Fulton, Vice President of Product Management in Semtech’s Wireless and Sensing Products Group. “Semtech’s LoRa Technology, a proven and flexible IoT solution, drives low-risk and fast-to-market IoT solutions enabling customers to drastically save as they grow their business." Visit Semtech at the LoRa Alliance™ booth, South Hall, 2524, at Mobile World Congress Americas to learn more about LoRa Technology. Learn more about the Apana’s LoRa-based solution here. Apana is a technology and services company that helps businesses manage water. Real-time, automated information empowers frontline operators with data to address problems when they occur and to institutionalize best practices throughout the organization’s water processes. Companies leverage Apana’s intelligence to reduce risk, strengthen operational efficiency and enhance sustainability measures to improve their bottom line. For more information, visit www.apana.com. Semtech, the Semtech logo and LoRa are registered trademarks or service marks of Semtech Corporation or its affiliates.